A poor LSAT score led the pizza chain's founder away from law school to a long-held career dream. 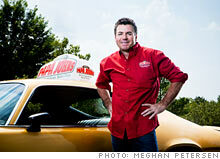 Despite the recession, Papa John's has increased its same-store sales throughout the year. Still, the chain remains third in sales after Yum Brands' Pizza Hut and Domino's. *Includes company-owned stores and franchises. (Fortune Magazine) -- When I was 12, I started a gutter-painting company at my grandfather's house. He was my mentor, and he expected us to work at an early age. My dad was into politics. He was the youngest city judge in Indiana's history, and he ran for lieutenant governor. So when Dad was on the road, Mom took us over to our grandfather's. Find something that comes easy to you. In school I always had to work harder than others. I bombed the LSAT and quickly discovered that law school wasn't for me. Every night I said, "God, just give me something I can do that I don't have to work three times harder than everybody else." It was Labor Day weekend in 1983, and Dad hired me to run Mick's Lounge, a bar he co-owned, for $200 a week. The business was nearly bankrupt. But I said, "Dad, I can fix it." It was the most natural thing I'd ever done. It just made sense to me. We added two more pool tables, cleaned up the place, and raised the food quality. I had this dream of starting a pizza business since college. I came up with the name, menu, and recipes back then. My dorm mate at Ball State came up with the logo. I thought if we sold $5 pizzas in the broom closet in the back of the bar and 50 beer in the front, we'd make a fortune. So we tore down the closet, installed a pizza oven, and began selling Papa John's (PZZA) pizza. Be willing to take on the big guys. We realized early on that Domino's (DPZ) had the speed, Little Caesars had the price, and Pizza Hut (YUM, Fortune 500) had variety, and yet they made up only 35% or 40% of the market. I didn't understand why the quality product didn't win every time. Why would you buy anything inferior? I thought if you had a national chain that acted like an independent as far as quality, then you'd have the best of all worlds. We have mystery shoppers rate pizzas on a 10-point scale. We measure 10,000 pizzas a month, so we know exactly what we serve every week. Executives get bonuses based on that pizza score, so we are aligned from top to bottom to make sure the customer experience is rewarded. Our first focus group was in our bar. It was like a little lab where we would try things out. If we made a mistake or wanted to get an opinion, there'd be 100 people there. Today we stay in touch with millions of customers through e-mail and Facebook. We tried pasta, we tried sit-down, we tried fried zucchini and salads. But the customers told us early on, "We like your pizza delivered -- you're a delivery chain." So we focused on the pizza.